Malegaon is a city in Nashik District in the Indian state of Maharashtra. It is like any other city of India, with its vast population hit by growing industries and hardships. It has an estimate of 3 lakh power looms producing about 10 million metres of cloth (Philipose). It has a mix of Hindu and Muslim population, majority of them being Muslims. Most of them work in power looms to earn their daily living. Malegaon has its share of woes, worries, poverty and suffering but, what makes this city special, is its very own Film Industry, popularly known as Mollywood. Mollywood is a thriving film industry that churns out spin offs of Bollywood and Hollywood films with twisted town-centric storyline ‘armed with just a ragtag crew and a shoestring budget’ (Ansari and Handa). These films are not exactly spoofs but a reinvention of the popular characters and situations, an appropriation into their own milieu. They may not be technically slick but they are hugely benefitted by a collaborative effort by the people of the town which results in high relatability. The people of Malegaon started making films using a VHS camera, and VCR to VCR editing was done. A tracking shot is canned by mounting the camera on a cycle’s seat with extra padding to ensure a jerk-free shot. A crane shot, on the other hand, is taken with the aid of a bullock cart minus the bullock. “The cameraperson takes the place of the bullock and a team helps lift the cart off the ground and brings it down again,” explains Shakeel Bharti, a mimicry artist and filmmaker (Ansari and Handa). Now, they are making films on CamCorder and edit using digital software and even using chroma for visual effects. This up gradation is a result of more and more people becoming an active part of the filmmaking process. The funding of these movies also happens collectively with many film enthusiasts within the town putting in their share. The town has developed an advertising model where local businesses give funds for including their shops/products/peoples and thereby giving them visibility. This model is also present in Bollywood by way of branding (recently movies like Dabbang 2, Satyagraha etc. actively indulged in characters promoting certain brands within the narrative) but while that serves a corporate purpose of promoting major ‘brands’ alienated from the public, in Malegaon it takes a more social connotation of helping each other in their ventures, promoting local ‘produce’ or ‘products’ that come from people themselves and involving more and more people in the filmmaking process. The actors are also common people of Malegaon working in power looms, so in a way, this filmmaking process not only becomes consumption of their fantasies but also gives them a sense of creating their own fantasies, worlds and destinies. These films are screened for the people of Malegaon that include a large number that participated in the making of the film itself, in a local video parlour. It would be inappropriate to look at these films as inferior copies of the ‘original’ films, because these films do not try to recreate popular movies. The characters may be same and a basic plot progression may also be somewhat similar but the themes and situations that are depicted are very local and are pertaining to the social situations of Malegaon. So the superman of Malegaon is not fighting a nuclear disaster or a fantastical villain but a local gutka baron. Thereby the film tries to address the issue of how gutka affects the health of those who consume it in Malegaon. The film also tries to include various concerns of the town and reflects on it. Like in one of the scenes of the film superman is shown trying saving people from drowning in a lake. This comes as a direct inspiration from the reality of the town where many people have drowned and died. Even this situation is dealt unconventionally where the superman himself drowns in the pond and other people end up saving him. 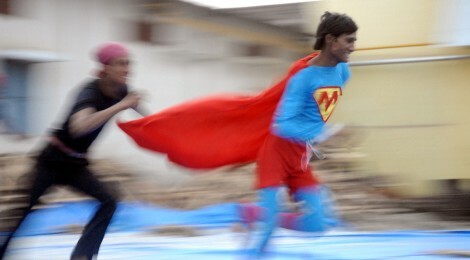 The ‘Superman’ in the movie is shown as a victim of diseases, and he is often portrayed falling down and coughing, has an asthma problem and also feels dizzy and all of this is attributed to the pollution in the town. While this phenomena of the film as an end product creating awareness and impact in itself is a commendable achievement the larger question that we ought to raise is what the filmmaking process itself means to the people of Malegaon. The issues and conflicts that dominate the narratives of these films are everyday issues of Malegaon ranging from widespread tobacco abuse, to mobile network problems to pollution. Now what happens when these issues intersect with the medium of cinema that the people of Malegaon are working with? When the people of Malegaon work with these themes on a film they transform these situations to either deliberate upon or depict a solution to the problem or at-least reduce their hardships to satirical humour. Thus when the medium of cinema is given to the these working class people, they tend to try and gain mastery over their difficulties or any situation for that matter and at-least on screen exercise agency to modify them to their wishes. Now there is a difference between films made about them by an ‘outsider’ giving such a feeling of mastery over situations and them arriving at ways to subvert them. What makes these films socially relevant is that the ‘subjects’ of the film (the people of Malegaon; Malegoan itself) are themselves re-appropriating their identities and contexts in the process of making a film. The people of Malegaon think about their problems, think about various ways present for them and also think about ways in which they can make meaning out of it for themselves. ‘If the audience could be made to participate in the making of a film, the resultant work would not be just a display of communication, but the result of co-ordination between them to handle and comprehend problems’ (Kaul 22). This article would like to argue that this model of filmmaking is far more socially relevant to the sections of working class people like those of Malegaon as opposed to commercial popular cinema. While Vasudevan calls the popular cinema as ‘cinema of attractions’ (Nayar 48), Ashis Nandy goes as far as to call popular cinema ‘self-assertion of the low brow’. Both Nandy and Ray seem to be interested in the ‘untutored minds’ and ‘low brow’ and their reference here is to the working class masses living either in urban slums or small towns. In doing so they are at a danger of justifying the style and content of popular films as they seem to be concurrent to the wants, desires and aspirations of these working classes, as though if cinema were to be made for this section of people then it has to be in the form of masala (what Ray calls a well mixed pot pourri ) entertainers. Ray and Nandy both perhaps ignore the factor of alienation or a huge gap between the making of the film and its working class audience. It is just opposite to the alienation that happens in the industries they work in where they are completely unrelated to the product they produce often which is not at all for their own consumption. In the case of popular cinema the product comes to them for their consumption while they have not taken any part in its production. Mani Kaul explains the phenomenon of popular cinema and its success in an articulate way. As Kaul puts it eloquently popular cinema has its popularity because it gives a conditioned illusion of involvement and wish-fulfilment on screen. Neither is this working class audience in any remotest way involved in the process of making the film nor is its wishes actually fulfilling in reality. If films have to be made relevant and meaningful to these people then films have to breakdown this alienation and act as creations by the people and for themselves. Thereby the films can become a way of creating ‘an object through which he (worker) could objectify himself’ as Kaul affirms. This is exactly what happens with films like Malegaon ka Superman made by the people of Malegaon, for the people of Malegaon. In the documentary Supermen of Malegaon there is a very poignant scene where the movie after it is made is screened for the first time for the public (the consumer) and we get to see that the public here consists mostly of various people of Malegaon who have done their part in either writing, directing, funding, facilitating, helping or acting (the labour) in the film (the product). Or more simply the audience is watching itself on screen tackling and transforming their own local issues, conflicts and other aspects in the manner they would like them to emerge. This also obliterates the alienation between the producer and the consumer. The chances of this model of filmmaking in becoming the almost ideal way of making socially relevant films would be crippled if the makers decide to emulate and imitate the pop icons and generalised populist notions and do not create anything of local significance. This suspicion is bound to rise since almost all the Malegaon films are spin offs of popular films. But as stated earlier the notion of these popular classics is totally deconstructed and subverted to create parallel almost counter-narratives to the popular text. The grand machismo of Superman is completely forsaken and the instead Malegaon’s Superman in a thin frail-bodied protagonist who has health woes himself. He is also scared of going into water and often lands up in hilarious accidents and quirky situations quite contrary to the established persona of ‘The Superman’. He even gets spitted upon by a random person unknowingly. While we could deliberate about the ideological underpinnings of this subversion, this article is more concerned about what this subversion indicates rather than what it actually means. One major inference that we can draw is that popular cinema, its representations and its relations to the masses are not as fulfilling as it is made to seem. Analysing the characters of Amitabh Bachchan in the films of 70s, Nandy claims that these characters act as ‘self assertion of low brow’ giving quite a convenient exposition to the internal desires and fantasies of the working class. But the question we need to ask is – why the iconic anti-hero characters of Bachchan in films like Sholey are also subverted and deconstructed to comic characters in films of Malegaon (Malegaon ke Sholey). This is indicative of a lack and clearly upholds Kaul’s argument that popular classics do not really satisfy the needs but act as Pavlov’s bell. It is precisely for this reason that when the medium of cinema is given to or taken up by the working class people to work with and create their own narratives, they reject the commonly held notions of these pop icons and nobody, be it Amitabh Bachchan’s angry young man or ShahRukh Khan’s romantic hero or a superhero like Superman is spared the subversion. Instead these pop icons are used to say things quite opposite to their dominant narratives. Thus all the difference is made by the decentralization of tools and techniques of cinema and inclusion of this working class in the process of filmmaking. For this model to work, the tools and techniques of filmmaking has to reach to these classes and sections of societies. Considering the massive cost of traditional film equipment this may seem like a distant reality, but the documentary Supermen of Malegaon shows how digital technology has enabled this democratization though very weakly and sparingly. CamCorder’s are getting cheaper by the day and almost many have a mobile video camera in their handsets. The technology of capturing motion pictures is spreading more and more across sections and classes of society. With distribution platforms like YouTube atleast the urban population is constantly exhibiting their stories in the form of film or video to the world and their own local community. If exhibition platforms are made available for the people to collectively watch enjoy and share their creation, this could add to the sociality of this mode of filmmaking. Also cultural knowledge in terms of technology and texts should be made more free and available to everybody. Piracy has enabled the people of Malegaon to expose themselves to world cinema and it is by watching the makings of those films at the end of the movie that they have picked up the ropes of filmmaking. While piracy is questionable we must strive to find fair legal means to enable such decentralization so that more and more people can gain the awareness that they can also make films. There is a threat that looms large with the sudden visibility that the people of Malegaon have received after Faiza Ahmed Khan’s documentary reached various film festivals. The threat being Malegaon films compromising their locality for a greater global acclaim. Bohra Brothers have bought the rights of Malegaon ka Superman and intend to release it nationally as ‘Yeh Hai Malegaon Ka Superman’ thereby making them a part of the Bollywood industry. There is a dangerous possibility for the people of Malegaon to aspire to become part of Bollywood league and thereby making films for a larger generalized audience and no more for themselves, beating the purpose of this model. It is to be noted that if such a thing happens it will be a result of economic aspirations rather than stardom because these people are financially not in a very good condition and aspire to do well economically. Improved economic conditions within Malegaon can save their filmmaking to be bitten by the Bombay Bollywood bug. Thus this article proposes as its conclusion that the present model of filmmaking in Malegaon transforms filmmaking itself into a social act and that this model bears vital socially relevance to the people of Malegaon. Ansari, Humaira and Namita Handa. “Malegaon ka film industry.” 15 January 2011. www.dnaindia.com. DNA. <http://www.dnaindia.com/entertainment/report_malegaon-ka-film-industry_1495032>. Faizee, Aleem. 12 October 2008. www.ummid.com. MOLLYWOOD attracts Global Media. <http://www.ummid.com/malegaon/malegaon%20film%20industry.htm>. Kaul, Mani. “Comments from the Gallery.” India International Centre Quarterly. 8.1 (1981): 100-102. Print. —.“Communication.” Cinema Situation. (1977): 22. Print. Khan, Faiza Ahmed. dir. Supermen of Malegaon. 2012. Film. Nayar, Pramod. Reading Culture Theory, Praxis, Politics. 1st Ed. SAGE Publications Pvt. Ltd, 2006 . 49. Print. Prashant Parvataneni, is an arts graduate from Christ University with majors in Journalism, English Literature and Psychology. He takes interest in film criticism and academic research in the area of formal studies, aesthetics and culture. He has presented papers at National Seminars in universities and his articles have been published in magazines like Deep Focus Cinema. Sezel S Lalwani, is currently pursuing diploma in Radio and Television Journalism from Indian Institute of Mass Communication. An aspiring journalist, she takes keen interest in studying the form and function of New Media. She was a part of the program - Study of United States Institute in New Media, at Oklahoma University. She has presented papers at National Seminars in universities and her articles have been published in magazines like The Mentor and The Soft Copy.